Everyone’s seen things like this, and we always dismiss them. Oh, Intel is laggy, we say. 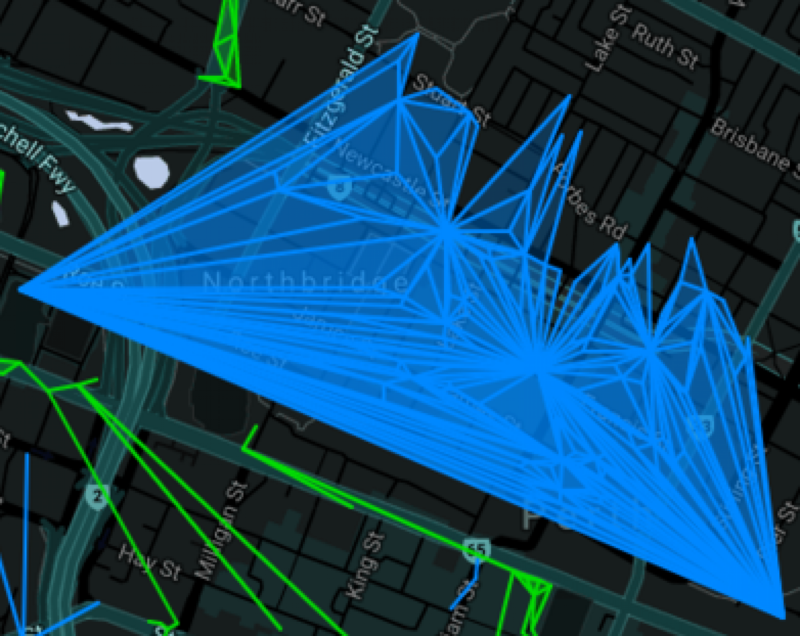 Go home, Ingress, you’re drunk. Sometimes, though, the impossible is real. 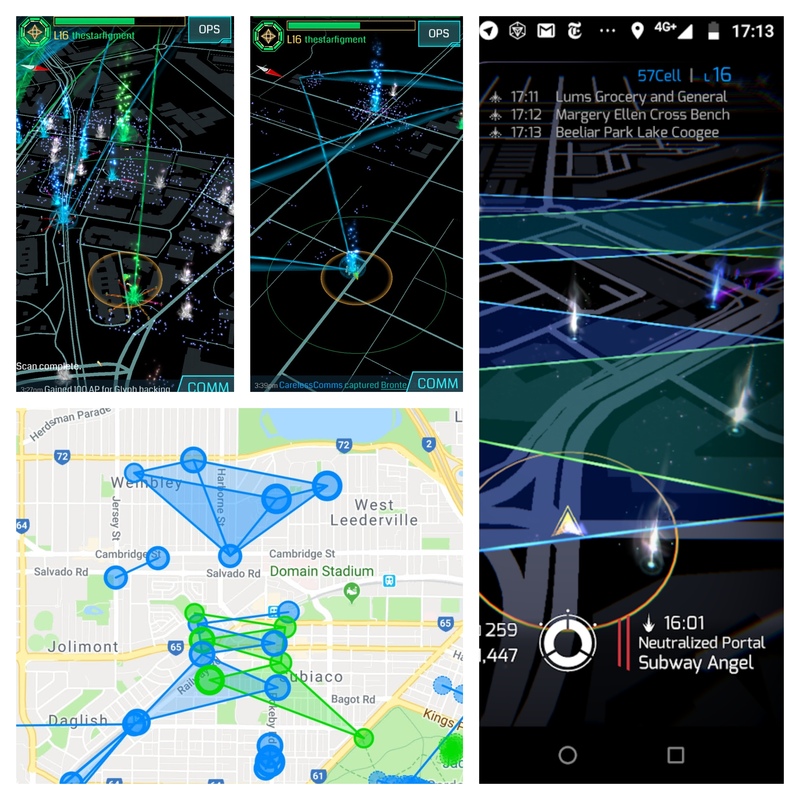 On a Sunday in late October, 2018, agents 57Cell, bluesfemme and octarine got together with a huge pile of keys, and settled in a local bar, to see if it really is impossible to cross links in Ingress. The screenshots above are the result. When two agents attempt a link at exactly the same time, there’s about a 50% chance that both links will go through. The links have to be very carefully synchronised – even a one second delay is too long and guarantees failure. 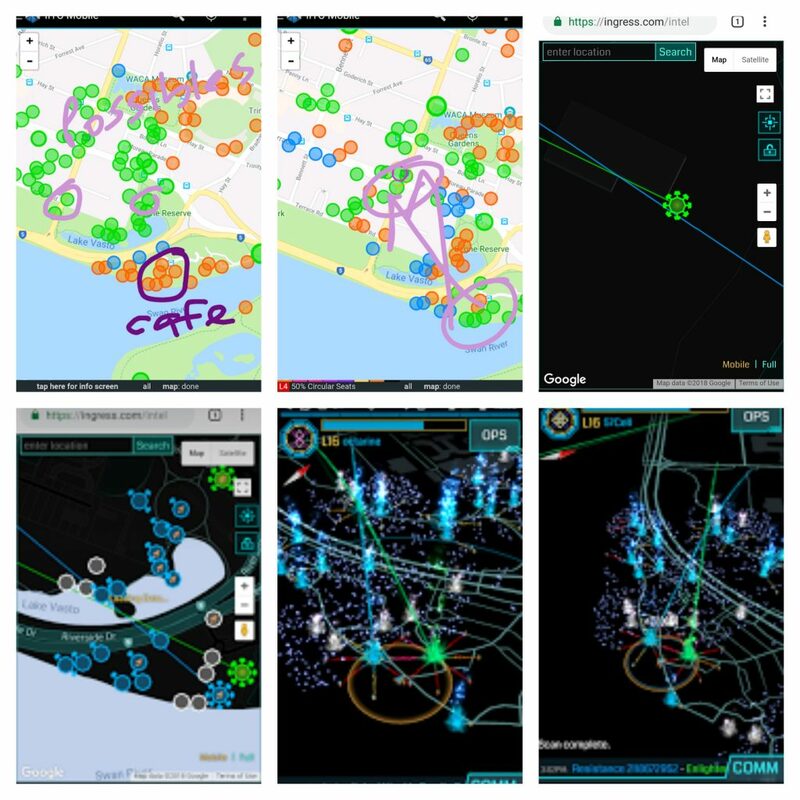 A plan was put in place for a cross-faction, cross-link operation. 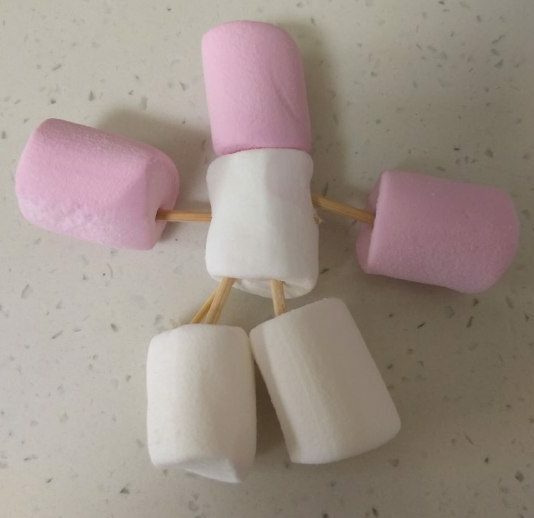 We dubbed it Op Marshmallow Man. A few more tests were done before the op. It’s possible to get two fields on the same side of a link. It seems to be impossible to get more than two fields per link, no matter what arrangement of crossed links you prepare beforehand. We also decided to test longer range links. To ensure the links were made simultaneously, we installed a floating stopwatch app, met to make sure our stopwatches were perfectly in sync, and then used Zello, the walkie-talkie app, to communicate the exact times links would be thrown. Again, about 50% of the attempts to make crossed links succeeded. Every time a link failed, we had to destroy the successful link so it would not block the next try. When a Jarvis/Ada is used to do this, that portal can not be used for the next attempt – the 1 hour cooldown after a second failed try would be much too long to wait. Cross-linking plans are cross-faction plans. 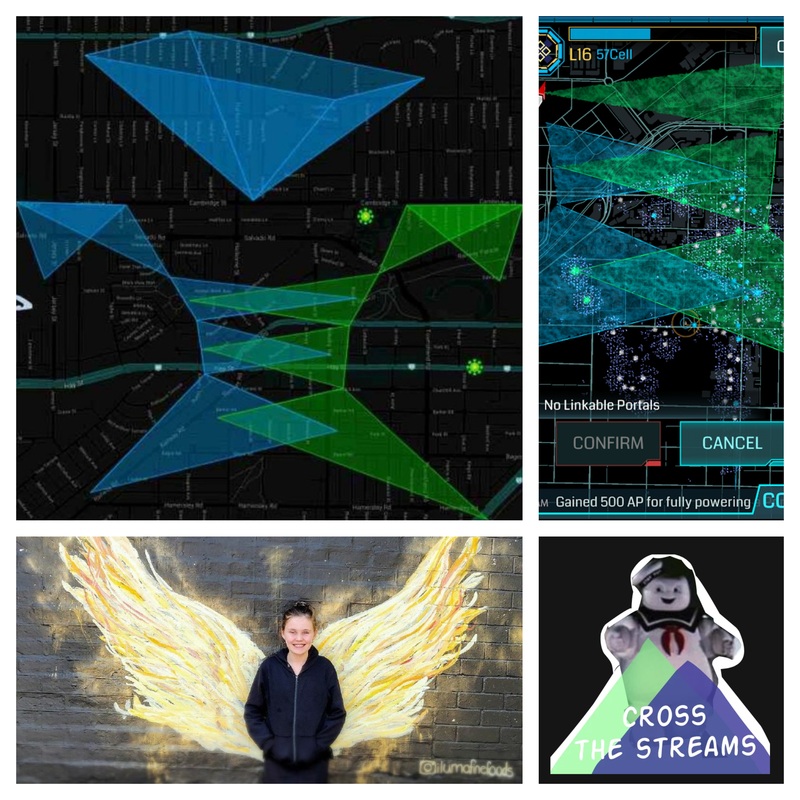 Although we’ve hardly scratched the surface of what might be possible with crossed links, and there’s so many more experiments we could try, we decided it was time for an Ingress Op featuring crossed links. 57Cell drew up a plan, and we started recruiting members of both factions whom we felt would be willing to work with the opposing faction. We kept in the dark about the nature of the plan, making vague excuses about why they needed to install floating timers, and why we needed to farm large (but unspecified) numbers of keys from certain portals. We also had a backup field art plan, in case crossed links suddenly stopped working! On Sunday, November 25, at 1:30pm, twelve agents met for the briefing by Intel, and to synchronise our floating stopwatches. Agents rolled out shortly before 2pm, and moved into position. At 2:11pm, at a precise time specified by Intel, BobKeever in South Team 1 and LittleKehua in South Team 2 made simultaneous crossing links, the first links of the op. North Team agents nzcoops and octarine also enjoyed success on their first cross-link attempt, at a precise moment some time during 2:17pm. The operation rolled along steadily after that, and by 3:43pm, the last link was thrown, competing the artwork. There was a brief scare when an agent passing through started to chip away at one of the anchor portals. 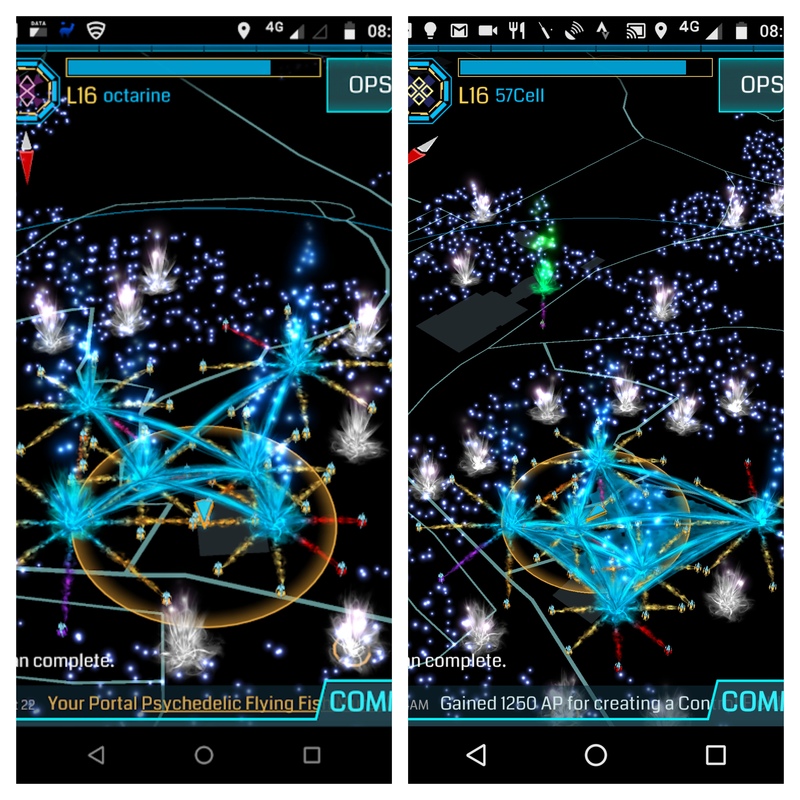 Quick action by the North Teams – recharging and patching the portal, and reaching out to the agent – saved the day. It took a total of 20 tries to make the 9 pairs of crossed links in the op. 17 other links were made, for a grand total of 35 op links and 11 destroyed links, enclosing a total 14 fields. 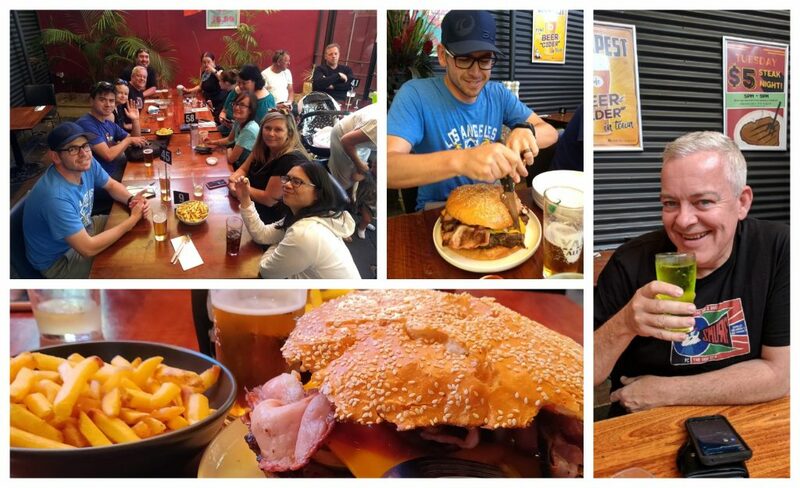 We convened, of course, to a local pub for a well-deserved celebration! Congratulations to all agents involved (listed below, in alphabetical order). Special thanks also to Tabiti, for assistance in producing an Intel recording of the operation, and to choccywabit, who recognised we were doing something amazing, and agreed to play elsewhere until we finished our work. 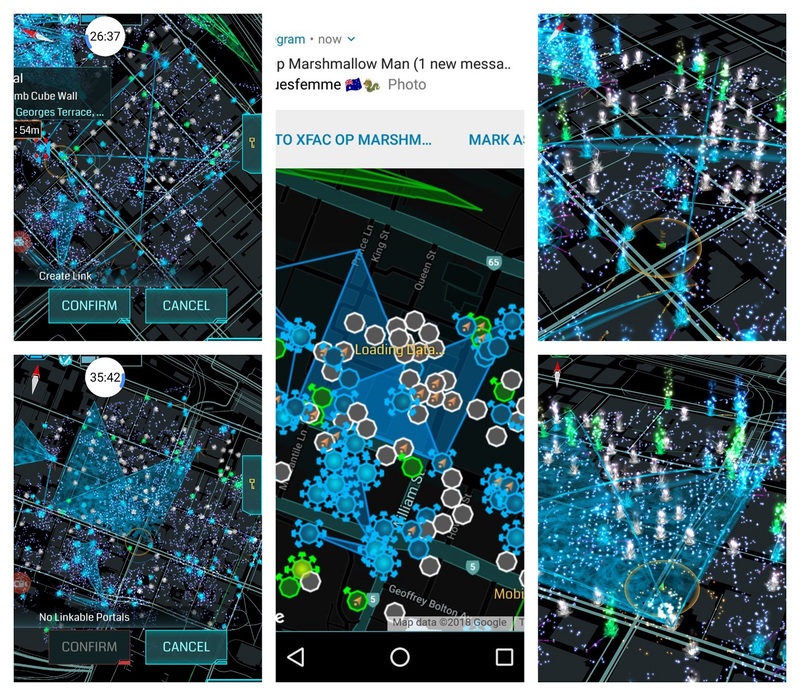 There are Google Photos albums of the initial experiments, and of the operation itself. You can also browse the annotated Intel logs. The team celebrates a successful operation! Fun op, went very well and possibly a first off! Great planning Michael, Sze and Talie!